Workers across New York City are organizing “99 Picket Lines” building up to May Day, where New Yorkers will join a broad coalition of unions, immigrant rights groups, community- and faith-based organizations, worker centers, and the Occupy Wall Street movement in a mass mobilization against the economic, social, and political injustice wrought by the one percent. Workers are organizing against Darden Corporation, owner of Capital Grille, Red Lobster, Olive Garden, and LongHorn Steakhouse. Employees have documented company-wide practices of wage theft, racial discrimination, overwork, and intimidation. Taxi drivers are marching to demand an end to rampant lease overcharges and calling for the first fare raise in over eight years to ensure that taxi workers can earn a livable income and create a Health and Wellness Fund. Sotheby’s has locked out 43 art handlers to replace them with low-wage temporary workers with no benefits. Sotheby’s is expected to sell Edvard Munch’s iconic painting “The Scream” for $80 million dollars at this auction. Most of the “99 pickets” will start from a convergence point at Bryant Park at 8am on the morning of May 1 and go to locations in midtown, including: Chase Bank, Standard and Poor’s, ABC, Wells Fargo, Blackrock, Fidelity, and Lazard. 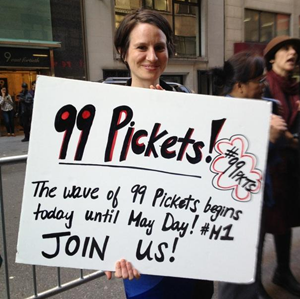 For more on the 99 picket lines, see: http://99picketlines.tumblr.com/, http://www.facebook.com/99PicketLines, or email: 99picketlines@gmail.com. For more info http://www.occupywallst.org and http://www.nycga.net.